When we set off for France’s indoor farm convention this week, we went in search of a farmer. But after endless moos and baas from hundreds of model livestock, we found something much better. An eccentric mayor who says he would like to ban…whingeing. 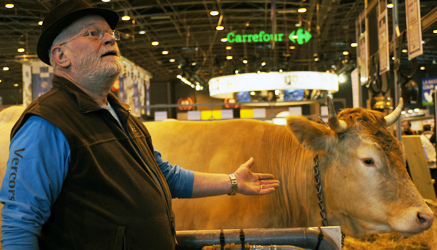 Wedged between two gigantic dairy cows in the noisy centre of France’s biggest indoor farm, Jean-Claude Potié tips back his head and guffaws. “Hear that? !” he shouts over to us, waving a toy speaker. “Moooooo!” His real cows, lined up side-by-side on a straw-covered platform, are not currently mooing. But his toy “moo-er” is on repeat. Jean-Claude with his "favourite cow". A few stalls away, presidential frontrunner François Hollande is chatting to farmers, beginning a long, and frankly stinky, afternoon of interviews. 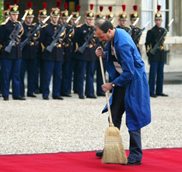 He’s not the only one to brave the stench for the all-important farming vote - Nicolas Sarkozy has already come and gone. (Much to the disappointment of the press, he managed not to call anyone a “sad prick” this time round). Cheese produced in the Vercors National Park. Jean-Claude reckons we buy too much imported junk in Europe – and it would be hard for anyone to disagree. He says he’d like to see both the government and shoppers playing an active role in changing consumption trends. No more flying strawberries halfway across the globe in mid-winter, for example. 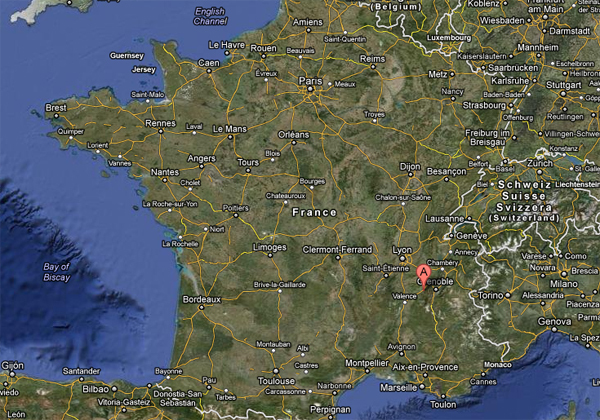 Jean-Claude's commune, Izeron, at the foot of the French Alps. All photos & videos: Sophie Pilgrim/ FRANCE 24. With out whine, what would we do with all the cheese?